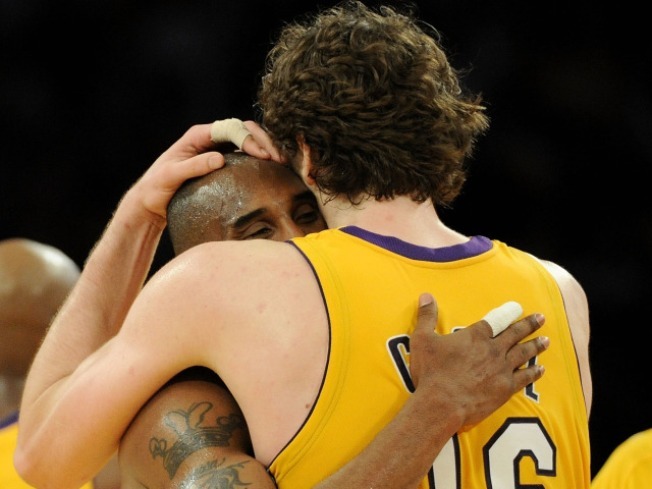 Kobe Bryant #24 of the Los Angeles Lakers hugs teammate Pau Gasol #16 in the fourth quarter of Game Two of the Western Conference Finals against the Phoenix Suns during the 2010 NBA Playoffs at Staples Center on May 19, 2010 in Los Angeles, California. LOS ANGELES - Whenever the Suns sent two defenders at Kobe Bryant, he coolly passed to an open teammate. When Phoenix loaded up down low against Pau Gasol, the Lakers picked them apart from the perimeter. Los Angeles’ triangle offense has the Suns running in circles after two terrific performances in the Western Conference finals — and the defending champions’ fans just couldn’t help looking ahead to a possible grand finale against Boston. Gasol scored 14 of his 29 points in the fourth quarter, Bryant had 21 points and 13 assists, and the Lakers roared away in the final minutes for a 124-112 victory Wednesday night to claim a series lead that seems much more daunting than 2-0. Although the Lakers took no bows after hitting better than 57 percent of their shots and scoring a jaw-dropping 252 points in the series’ first two games, it’s clear Bryant and Gasol are leading a clinic in offensive hoops against one of the NBA’s highest-scoring teams. After Bryant scored 40 points in 35 minutes in the series opener, the Suns tried to double-team him more regularly in Game 2 — so last season’s NBA finals MVP racked up the most assists by a Lakers player in a postseason game since Magic Johnson in 1996. Bryant’s streak of six straight 30-point games ended, yet he capped his night as a creator by setting up Gasol for two tough baskets in the final minutes, with Gasol scoring with a flourish and drawing a foul each time. Game 3 is Sunday night in Phoenix. But unless the Suns figure out a way to stop Los Angeles’ versatile, poised offense, Beantown and Hollywood could be just a few days away from another chapter in their storied rivalry. The Lakers have lost only one best-of-seven playoff series in franchise history after taking a 2-0 lead, winning the other 41. The 15-time champions haven’t won eight straight games in the same postseason since their famous one-loss run through the 2001 playoffs. The crowd enthusiastically booed Amare Stoudemire, who on Tuesday belittled Lamar Odom’s 19-point, 19-rebound performance in the opener as “a lucky game.” Stoudemire appeared determined to back up his words with aggression, finishing with 18 points and six rebounds while Odom had another superbly lucky game off the bench. Grant Hill scored 14 of his 23 points in the third quarter while Phoenix erased a 14-point deficit, playing with more efficiency and aggression than in Game 1. But the Lakers went back ahead by 11 midway through the fourth with a 9-0 run, and the Suns couldn’t stop Bryant and Gasol from executing their two-man game to perfection. Jason Richardson scored 27 points for Phoenix, and Jared Dudley hit five 3-pointers.